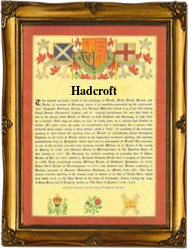 Recorded as Hadcroft, Hodcroft and Odcroft, this is an English surname, and one which seems to be well recorded in the county of Lancashire. It is clearly locational although no such place in any of the known surname spellings has been positively identified. This is not entirely unusual. It is estimated that at least three thousand villages and even small towns have disappeared from the maps of the British Isles in the past five hundred years, and most have given rise to surnames. As to why there has been such a large loss has been the subject of several books, but changes in agriculture through drainage and enclosure, creeping or sometimes galloping urbanisation, as well as coastal erosion, war, and the Great Plagues all played a part. The place name and hence the later surname probably means either Hadda's small farm, or Oda's small farm, with the prefix "H" being added in the Middle Ages as an aid to pronunciation. This is also found in such places as Huddersfield, formerly Oda's feld. Examples of recordings in the surviving church registers of Lancashire include Edward Hadcroft of Middleton by Oldham, on March 30th 1617, Daniell Odcroft of Leigh on February 7th 1619, and John Hodcroft at St Nicholas Liverpool, on May 26th 1791.